I think we can safely say that paddle boaters were here first! And now, as recreation, the number of people involved in some type of paddle sport is rising. Paddleboaters are now the fastest growing segment of the boating community. Growth in the sport exceeds 270% within the most recent decade. Canoes and kayaks have a rich tradition of waterway transportation and recreation. 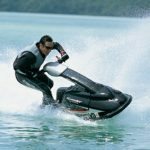 But in today’s age of large, fast motorized craft and their wakes, human-powered craft are among the most vulnerable to accidents and fatalities. Kayaks, canoes, and other slow moving vessels can be difficult to spot and cannot maneuver or change course quickly. 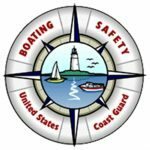 The responsible boater recognizes that, and takes reasonable precautions when operating in canoe and kayak waters. Remember, our waterways belong to everybody! In 2007, one hundred seven fatalities were attributable to canoes, kayaks, and rowboats. The use of properly fitted life jackets could have prevented nearly all those fatalities. Life vest. 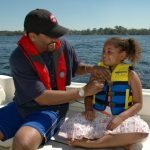 Your personal flotation device should be highly visible, adjust to accommodate different clothing weights and allow free arm movement. It should also be comfortable enough to wear zipped anytime you?re on the water. Spray skirt. A spray skirt seals you inside the kayak. One end fits around your waist, and the other end attaches to the cockpit coaming. Although not completely waterproof, a spray skirt keeps water out of the cockpit, protects your legs from the sun and keeps you warm in cold weather. Bilge pump. A hand-operated bilge pump can help you remove water from your boat. Make sure it has a float collar so it won’t sink. Paddle float and rescue sling. An inflatable bladder that slips over a paddle blade, a paddle float provides flotation and support when you re-enter your boat from the water. A rescue sling is a piece of floating line made into a loop with double fisherman?s knots. It?s useful for rigging a stirrup to give you a boost as you climb back into the cockpit. Spare paddle and paddle leash. Signaling devices. You?ll need a variety of sound and visual signals for day and night use. Your stash should include a waterproof flashlight, whistle, flares, strobes, smoke canisters, dye markers and signaling mirrors. VHF radio and cell phone. A VHF radio lets you put out a distress call to the Coast Guard and nearby boaters. A cell phone is best for staying in touch with people on shore. In 2000, twenty eight states in the U. S. had requirements that non-powered vessels be numbered, and 24 states required registration. Sixteen states required titling of non-powered vessels, and seven required payment of a user fee. If you’re not sure of the registration laws in your state, you should find out. WEAR A LIFEJACKET…Most canoe spills take place in shallow water and swift current. There is a good probability that a dumped canoeist could hit his head on a rock or his boat. It is nearly impossible to swim in rapids, or through downed trees. 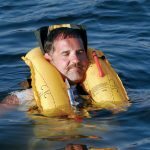 A life jacket is essential, not only for flotation, but for hypothermia protection. And by the way, after most drownings from canoes or kayaks, life jackets are seen floating nearby…empty. You have to WEAR them! FILE A FLOAT PLAN…If you’re on a canoe or kayaking trip, somebody ought to know if you get into trouble, and the only way that can happen is if you tell a friend in advance of your trip . Give that person the names of all passengers or companions, the place you’ll be starting and ending your trip, when you plan to arrive at your destination and any waypoints in between. 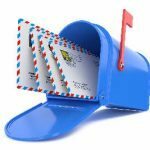 You should also include phone numbers of law enforcement agencies along the way, with instructions on when and who to contact if you are overdue. BE HONEST…It’s important to know the limitations of your abilities. Be honest with yourself and your companions. Your life and the lives of those in your party may depend on how everyone understands each other’s capabilities. If you overstate your abilities, eventually someone is going to be counting on help that you won’t be able to give them, so if you’re a novice, admit it. If you’re a pro, admit that, too. The novices in the group will feel better knowing you’re along on the trip. KNOW THE WEATHER…A waterproof weather radio or hand held VHF Marine radio can be a big help when the skies begin to darken or you get a sudden wind shift. 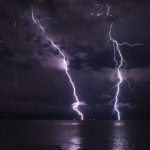 Check the sky and sea conditions, and NEVER operate in a situation that exceeds your capability. KNOW THE WATER…Don’t attempt rivers or rapids beyond your ability. Progress gradually from one skill level to the next. Unfamiliar waters are no place to test your limits, or try to impress anybody. Each stream or river presents unique challenges, and dangers. Even well-seasoned veterans need to become familiar with the body of water before embarking on a journey. KNOW THE WATER STAGE…After heavy rains, streams, rivers, and creeks rise and sweep lots of debris from the shoreline. Debris can become a trap or hindrance in water incidents. Debris can be found in three levels: on the surface, suspended in the water and on the bottom. 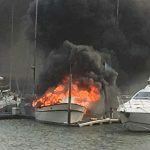 It’s important to remember that just about any material or object may be in any, or all, of the three types of debris in water. Suspended and bottom debris is usually invisible to you, and therefore are especially dangerous. GO IN A GROUP…Boating alone is not recommended. Even though recreational canoeists often canoe with a single canoe and one partner, or even solo, it is recommended you canoe with at least three people or two craft. The less the skill of the paddler, and the less that is known about the stream, the more important this rule becomes. CLOTHING…Dress properly for existing and expected conditions. Extreme cold requires wet or dry suits, but in more moderate conditions layered clothing is recommended. Fabric choices should include those that provide warmth, even when wet. Cotton should never be worn in cold weather conditions because they “wick” heat away from the body when wet, accelerating the affects of hypothermia. Wear a wide-brimmed hat to protect your head, neck, and ears from the sun. EYE GLASSES AND SUNGLASSES…You’ll need a strap for attaching them to your head. This is particularly important during a capsize when eyewear can easily slip off and go to the bottom. FOOTWEAR…Don’t forget shoes. Tennis shoes are best for canoeing and should be worn at all times. Bare feet have no place in canoeing…the terrain of the land and the bottoms of streams can be hazardous. CARRY PROPER EQUIPMENT…Carry a spare paddle in the boat, and a small PVC type bilge pump. The pump should have a flotation collar, and is essential to get a kayak cockpit pumped out before the next wave breaks. Equip your craft with bow and stern lines. An extra safety throwing line (at least 50 feet in length) can be very valuable. But be careful how you stow these lines. If the canoe spills, feet can become entangled in loose lines, and this can lead to serious trouble. There should be nothing around which will attach someone to a swamped canoe. Loose lines can be deadly. You’ll also want to pack a First Aid Kit and secure it to the boat. Paddle sports enthusiasts often operate in remote areas where medical attention is not readily available. And it wouldn’t hurt to take a first aid and CPR course while you’re at it. Store small items such as sunscreen and bug repellent, food and snacks in a waterproof dry-bag, tethered to the boat. When tying down these items, make sure they are stowed in an area that will not interfere with the users’ ability to exit the vessel safely in the event of a capsize. Emergency signalling gear should be stored in the pockets of your PFD and tied down so that when accessed they won’t be lost. USE A SPRAY SKIRT…Add to your comfort and warmth while kayaking by keeping as much water out of the cockpit as possible. A passing boat might toss a wake, or just a change in weather can cause splashing into your quarters. Know how to attach it properly, and know how to remove it quickly in an emergency. LOADING YOUR BOAT…Distribute the weight evenly. Look for ways to save space and to leave excess weight behind. BALANCE YOUR BOAT…Make sure your boat’s load is balanced, side to side and front to back. Don’t overload the boat, and if your are carrying cargo, make sure it’s secured so it doesn’t shift around. 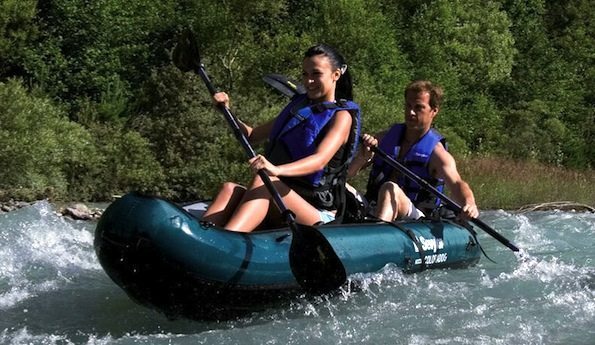 DON’T CROWD YOUR BUDDY…In rapids and restricted passages, keep a safe distance behind other boats. Don’t crowd, and back paddle if necessary. The lead boat should pull up and wait after passing a difficult area. If someone encounters trouble, be willing to stop and offer your assistance. At put-in and take-out points, be courteous and take turns. STAY OUT OF FLOOD WATERS…Growing up on the Mississippi, I remember the temptation to get out the canoe and paddle around the streets running swift with flood waters. But flood waters can exert several tons of force on a canoe pinned against a tree or bridge pier or the side of a building. A canoe can be pinned under a log jam or downed tree, trapping its paddlers. So stay out of flood waters. And if you happen to be canoeing or camping and heavy rain forces you to leave – don’t try to cross waterways with heavy drainage. We don’t want to read about you in the morning news. Tighten your clothes and try to cover your head. Act quickly before losing use of your hands. If possible, right a capsized boat or climb atop it. Don’t swim unless it’s to reach a nearby boat. Swimming saps heat and cuts survival time in half. Stay as still as possible. Movement robs you of heat. Assume a position in the water which minimizes heat loss. If you’re in the water with one or more persons, huddle together closely. If you’re a rescuer, don’t apply heat to arms or legs, or give massages or hot baths. The best way to warm a victim is with body-to-body contact and a tight blanket. HANDLING HOT WEATHER…Hot weather can be as dangerous as cold water. Carry plenty of drinking water. The water surface and aluminum canoes cause considerable reflection on sunny days which may lead to serious sunburn, heat exhaustion or sunstroke. Everyone enjoys getting out in the sun, but canoeing in a swimsuit or bikini can be dangerous. Canoeists need to wear or carry a shirt, blouse or jacket. Hats or other head coverings help prevent heat exhaustion or sunstroke. Know the symptoms and first aid procedures for these serious conditions. OVERBOARD IN CURRENT…In rivers with a current, stay upstream of the boat to avoid being pinned. Don’t float with your body on the down river side of the canoe. Staying upstream allows you to avoid being pinned against obstructions. Even a light current flow can cause you to be pinned between an immovable object and your canoe. Stay away from strainers (trees and parts of trees or posts which are submerged and subject to strong currents), and sweepers (low-hanging branches which touch the water in a current). If you are swept by the flow against an obstruction, lean your body toward the obstruction instead of pushing away. Pushing invites the flow to come in and over the side more quickly. IF YOU DUNK…Be ready for an occasional dunking when you canoe. Don’t panic. In calm waters, angle your way up to shore instead of paddling straight. Stay behind the boat, and hold onto it for flotation. Always wear your life jacket. IF YOU CAPSIZE…If your boat capsizes, don’t panic. Your canoe can be flipped back over. Over-turned canoes float. First, assure that all passengers are safe before attempting to retrieve equipment. Stay with your canoe unless you judge that doing so will be dangerous. If you can stay with the canoe you can guide it into quiet water. Stay at the upstream end of the canoe so that if the canoe becomes pinned, you don’t. If possible hold on to your paddle…you’ll need it later. Don’t try to swim in rapids. Float in your life jacket on your back, with your feet downstream. If the water is cold, get ashore quickly. IF YOUR BUDDY CAPSIZES…If someone else’s canoe has dumped offer your assistance. If it comes down to a rescue, remember…it’s the people first, then the equipment. If it’s cold, get them ashore, dry them and warm them immediately. It may not occur to them that they’re uncomfortable because of confusion. Above all, keep calm and encourage the “dunkees” to do likewise. Standing up or moving about in a canoe greatly increase the chance of capsize. Maintain three points of contact while moving around. Keep your shoulders inside the gunwales of the boat. Don’t drink alcohol immediately preceding or during a paddling trip. Understand your limitation and that of the vessel.